The Foster family of Wisconsin were vibrant and happy in the early years of the 20th century. Like many families in the area, they were descended from German immigrants and had a healthy appetite for hard work and beer. Barbara Foster, widowed early in life, created a loving home for her children Leo, Ottilia, Mary, and Kunigunda. They were all musicians, forming their own orchestra and playing in regional and local venues. But despite Woodrow Wilson’s promises, America found itself drawn into the Great War overseas, and Leo Foster, bugler for the Wisconsin National Guard, was sent to the front lines. 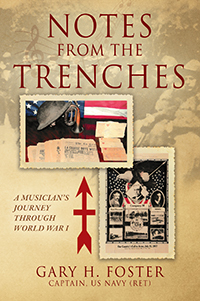 Nearly a century later, this book reconstructs Leo’s World War I experience from letters, newspaper clippings, and photographs from Leo’s footlocker. Nothing compares to the immediacy of the war experience in a soldier’s own words. Notes from the Trenches follows Leo from stateside training to the horror of the Meuse-Argonne offensive and his battle-weary return home in May of 1919. Full of wit, good humor, and honesty, these letters provide a fascinating window into the War to End All Wars, with insightful organization and context from Leo’s grandson, Gary Foster. Leo’s son and my dad, John Foster, recounted on several occasions how Leo was declared deceased. As the battle raged on and Leo lay stricken on the battlefield motionless, the medic responsible for treating the wounded saw the blood from his head, took his pulse, and not finding one, marked him as deceased. One of his later letters tells of how his heart was weak through his recovery, so it would make sense that he may have had an undetectable weak pulse, causing the battlefield medic to mark him as deceased. On the battlefield, at some point--how much later is unknown--Leo moved his arms or legs and was noticed by those personnel assigned to transporting the injured and to the burial squad. The war did not stop because someone was killed or injured. Due to the rapid advance of the Division in taking Hill 230 and beyond, the rapid assessment of KIA (killed in action) and wounded was required. So Leo may very well have been given up for dead. His next letter, 17 days after being wounded, verifies this to some degree, as he has learned about how he sustained his injuries and the reaction of his fellow soldiers that carried him away. 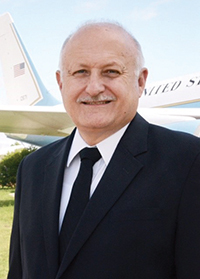 Gary Foster, Leo Foster’s grandson, was inspired by his grandfather’s legacy and served for 27 years in the US Navy as a naval flight officer.